The Cook Islands are a series of fifteen magical islands in the South Pacific. In addition to its abundance of island activities, the Cook Islands are a popular place to experience Polynesian culture. There is a rich history and culture to explore, and locals love introducing tourists to their way of life. Due to their proximity to Australia, the Cook Islands are the perfect place to go for a quiet and authentic island experience. Once you factor in flights and a hotel, planning a trip to the Cook Islands can get expensive. In order to save money, consider bundling together your holiday expenses with Webjet’s Cook Islands holiday packages. 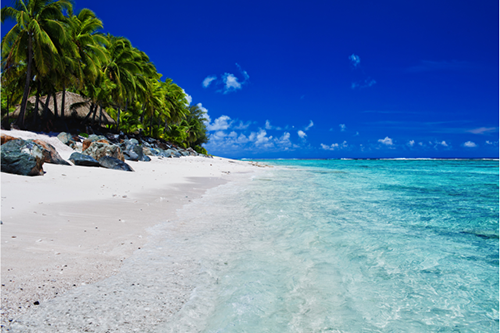 Webjet offers Cook Islands packages that will save you both time and money on your booking. Bundling costs can save up to several hundred dollars on your Cook Islands holiday. There’s no need to dedicate all your holiday-planning time to searching for the best deals. Webjet will help you find great prices, so you can focus on organising the fun activities you’ll enjoy in the Cook Islands. Cook Islands accommodation and flight packages are great options for families in want of a bargain as well as couples looking for a romantic destination. Start planning your tropical getaway with Webjet’s Cook Islands holiday packages from Australia. When planning a trip to the Cook Islands, there is one airport you can fly in from overseas. Rarotonga International Airport (RAR) is located on the largest island in the Cook Islands, Rarotonga. Rarotonga is centrally located within the Cook Islands, so you can easily catch connections to the other islands of the country. Flying from Australia, you can catch a flight to the Cook Islands on Virgin Australia, Qantas, Air New Zealand, and Jetstar. The majority of flights from Australia include a stopover, typically in Auckland. Air New Zealand also offers a direct flight from Sydney about once a week. This flight will get you from Sydney to the idyllic Cook Islands in about 6 hours. The Cook Islands offer a variety of accommodations with easy access to the beach. Whether you’re looking for budget or luxury, you’ll have no trouble finding a hotel for your stay in the Cook Islands. Accommodation options include beachfront bungalows, resorts on their own private island, and villas built in the traditional Polynesian style. This luxurious resort has been in operation for almost 50 years. It’s located on the west coast of Rarotonga within easy access of the ocean, jungle, and mountains. The resort also experiences some of the best sunsets in the Cook Islands. Rooms are set up like apartments, ranging from simple studios to 3-bedroom beachfront villas. The Edgewater offers a range of activities and amenities to its guests, including a spa, swimming pool, complimentary breakfast, and a nightly Polynesian cultural show and feast. The Muri Beach Club is an adults-only resort that is right on the banks of the Muri Lagoon. The lagoon has some of the most impressive coral reefs in the country, making it the perfect place for snorkelling, kayaking, and going for glass-bottom boat tours. At the resort, you’ll find every amenity you could need, including a spa, swimming pool, restaurant, snorkelling gear, kayaks, scooter rentals, and more. With its serene atmosphere and bright, airy rooms, the Muri Beach Club is the perfect resort for couples. The Sunrise Beach Bungalows are a family-friendly spot in Rarotonga. The resort has its own private beach and is set back from the main road, guaranteeing the ultimate tropical experience. A number of amenities are available to guests, such as free snorkelling equipment, barbecues, daily breakfast, a tropical garden, and a swimming pool. Guests staying more than two nights can also enjoy a complimentary shuttle transfer to and from the airport. Rather than standard hotel rooms, guests stay in bungalows overlooking the beach or the gardens. It makes for an authentic Polynesian experience that you’ll never forget. The Cook Islands consist of fifteen islands in the heart of the South Pacific. As you would expect of Pacific islands, the Cook Islands are abundant in natural beauty, with beaches, jungles, and caves. The crowds are never large in the Cook Islands, allowing you to appreciate the tropical atmosphere and take in the local culture. The Cook Islands are the perfect place for both relaxation and adventure, making them a great destination for all different types of travellers. The Cook Islands are part of Polynesia and have a fascinating culture. The Polynesian culture consists of art, folklore, food, music, and dancing. Learn more about the culture by mingling with locals and attending a cultural show. Cultural shows are held regularly across the islands. When you attend a Polynesian cultural show, you can expect a feast of local food accompanies by traditional music and dancing. While the Cook Islands are mainly known for their beaches, the interior of the islands are just as breathtaking. Head inland to experience tropical jungles made up of exotic plants, trees, and lots of waterfalls. There are several hikes available in the Cook Islands. The most popular is the Cross-Island Track in Rarotonga. If you are an avid hiker, some other ones to visit include Mount Maungapu and the Mount Raemaru Track. Surrounding the Cook Islands, you’ll find some of the most gorgeous coral reefs and atolls in the Pacific. The best way to experience the coral is to see it up close by snorkelling or diving. As well as coral, you’ll be able to spot tropical fish and even the occasional sea turtle. Snorkelling is available off most of the beaches in the Cook Islands. Some of the best places to snorkel or dive include Aroa Beach, Tikioki Beach, Muri Lagoon, Blackrock Beach, and Honeymoon Island. You can’t visit the Cook Islands without spending some time at the beach. While all of the beaches are beautiful, some offer an especially scenic experience. Some of the top Cook Islands beaches to have on your radar include Muri Beach, Titikaveka Beach, Takauroa Beach, Oravaru Beach, and Nikao Beach.